So, I was eating my oatmeal this morning and enjoying how good it was...which got me to thinking about the other ways oatmeal can be served. Granola came to mind, and suddenly I had a huge craving for some granola! But not the kind you buy at the store, the home made stuff...where you throw in all the things that you enjoy and make it your own type of granola. I hadn't made any in years, and so I was quite excited to make a batch of it. I found some almonds, and pistachios as well as some coconut (which I like to put in everything), and some dried cherries and golden raisins...this would make up my granola! I decided to sweeten it with honey, and use almond oil instead of the boring old canola. And to keep it interesting I had to add a touch of vanilla and almond extracts! It turned out fabulous, and very addictive, so I decided that I must share the recipe! I can't imagine why anyone would want to buy storebought granola ever again! Line a large baking sheet with non-stick foil, and spray with cooking spray. Preheat the oven to 350 and set rack at the medium position. In a large bowl, combine oats, almonds, pistachios, and coconut, and set aside. In another bowl, whisk together oil, honey, maple sugar, sea salt, almond and vanilla extracts until well combined, then pour over oat mixture and toss to coat until completely blended. Pour out onto prepared baking sheet, and spread out evenly. Bake for 35 minutes, stirring about every 10 minutes or so until the granola is evenly browned. Remove from oven and let cool. Stir in cherries and raisins, and enjoy! I'm with you on the store bought granola - after you make your own and taste how much better it is homemade - there's no going back! I could wake up to that. Cheers! Yummerz! 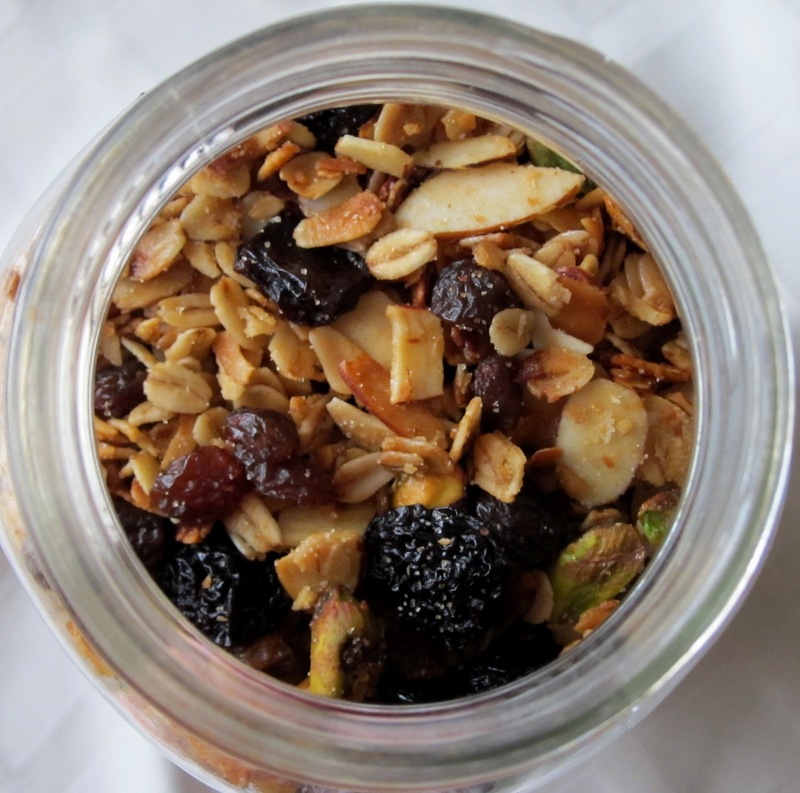 I make homemade granola too-like that you used some almond extract.